The Bank of Canada's decision on January 19, to cut the policy rate to 0.75% from 1.00%, took forecasters by surprise. The only thing that surprised me (see here) about the move was that it happened in January and not at the next meeting in March. The BoC clearly saw the magnitude of the negative shock of the plunge in the price of crude oil as justifying the surprise. Indeed, markets were already pricing in a 50% chance of a rate cut by June, so were less surprised than economic forecasters. None of the economics groups at Canada's Big 5 banks expected a rate cut in 2015. Indeed, four out of five expected the policy rate to rise, beginning some time in the second half of the year (Scotia Bank was the exception). The rate hike forecasts were predicated on forecasts of modestly above trend real GDP growth, a gradually shrinking output gap, and inflation moving up to the 2% target by the end of 2016. Although the price of crude oil had fallen by about half by mid-January, no major changes had been made to private sector growth forecasts for 2015, and the inflation outlook treated the oil price drop as a temporary phenomenon that could be "looked through". This consensus view of December was blown apart by the BoC's action and the accompanying Monetary Policy Report. Forecast revisions have begun and, for some of the banks, are still a work in progress. Looking at their websites, it is possible to get an idea of the magnitude and direction of the revisions. TD Economics was the first off the mark with a complete re-forecast. It lowered the assumed 2015 average price for crude oil to $47/bbl from $68/bbl in its' December forecast. The 2015 real GDP growth forecast was cut from 2.3% to 2.0%. The CPI inflation forecast for 2015 was cut to 0.4% from 1.5% in the December forecast. 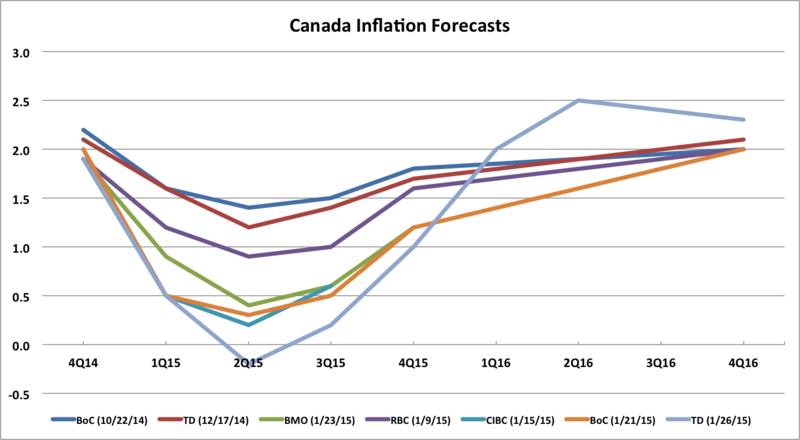 The chart below shows the evolution of CPI inflation forecasts since the Bank of Canada's October Monetary Policy Report. Forecasters still view the decline in the price of crude oil as causing a temporary drop in the inflation rate. The forecast for inflation at the end of 2016 is the same or possibly higher than it was in December. Of course, the forecast level of the CPI is lower, but the rate of inflation at the end of 2016 has barely budged. This outcome is to be expected in the Bank of Canada's projections because the Bank's mandate is to return inflation to the 2% target over 6 to 8 quarters. Private sector economists don't have to mimic the BoC forecast, but they pretty much always do. So how has this weaker growth and lower inflation outlook altered forecasts for the Bank of Canada's policy rate? 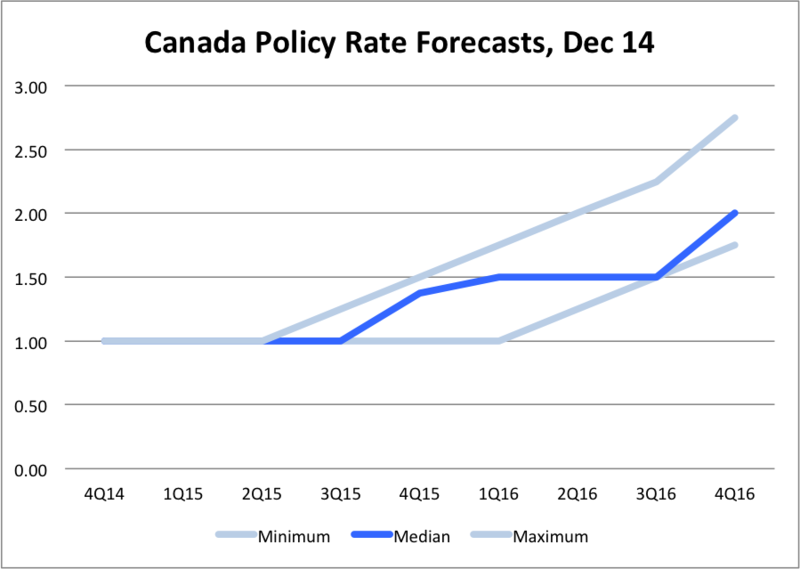 The following charts compare the minimum, median, and maximum policy rate forecasts made in December with the most current forecasts. moving up, with 4Q16 forecasts ranging from 1.75% to 2.75%. to 2.75% by 4Q16. 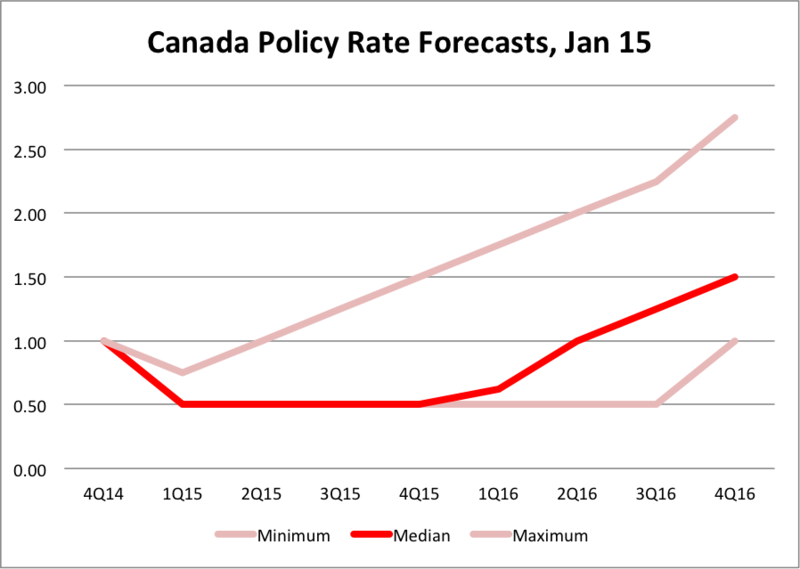 The median forecast expects another rate cut to 0.50% in March, before the BoC goes on hold for the rest of 2015 and then raises to policy rate to 1.50% by the end of 2016. One bank, TD, expects the BoC to hold the policy rate at 0.50% through 3Q16, and then to raise it to 1.00% in 4Q16. The actual outcome will depend on how low oil prices move and how long they stay low. It is not inconceivable, if oil prices fall to $40/bbl or lower and stay down, that the BoC might lower the policy rate to its 2009 low of 0.25%. Some economists have suggested that the cut to 0.75% and possible further cuts risk stoking a housing bubble and eventually a crash when rates eventually rise. This seems unlikely. House prices in the oil producing regions are already falling as oil incomes plummet. In oil consuming regions, a sharply lower Canadian dollar is making imports more expensive, offsetting much of the windfall from lower gasoline prices. The banks have been slow to lower mortgage rates, so the risk of fuelling a housing bubble seems limited.